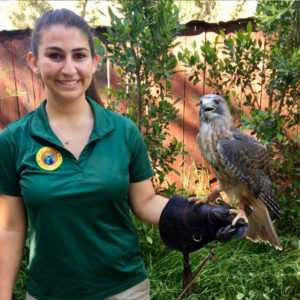 Lauren began her journey to Wildlife Learning Center (WLC) as an intern in 2015. She quickly fell in love with both the animals and mission of WLC—and could not be more excited to join the team as a biologist! Lauren graduated from University of California, Los Angeles in 2016 with a degree in Geography/Environmental Studies. Her primary focus was in animal conservation and biology. Additionally, she minored in GIS&T (Geographic Information Systems and Technologies). Lauren’s passion for wildlife skyrocketed after a conservation mission to the Galapagos Islands in high school. She was fascinated not only with the incredible biodiversity, but also with the local people and their perspectives on the wildlife that cohabit their island. This trip fueled her interest to pursue Geography at UCLA. This interdisciplinary field overlaps the importance of wildlife conservation and biodiversity with the needs, opinions, and values of local communities. In the future, she hopes to pursue a graduate degree in GIS and utilize remote sensing applications to study biodiversity and conservation trends. Finally, Lauren believes that no matter where in the world you are, you can have a positive impact on the planet. Education is an essential key to conservation. As a wildlife biologist, she hopes to inspire and educate as many people as possible about the global importance of wildlife, big and small.